Are you a VIP? The Blackwall Barn & Lodge invites you to join the Barrel Club. Purchase a limited edition Barn & Lodge mug and receive lifelong drink discounts, special access to invite only Barrel Club events and more! 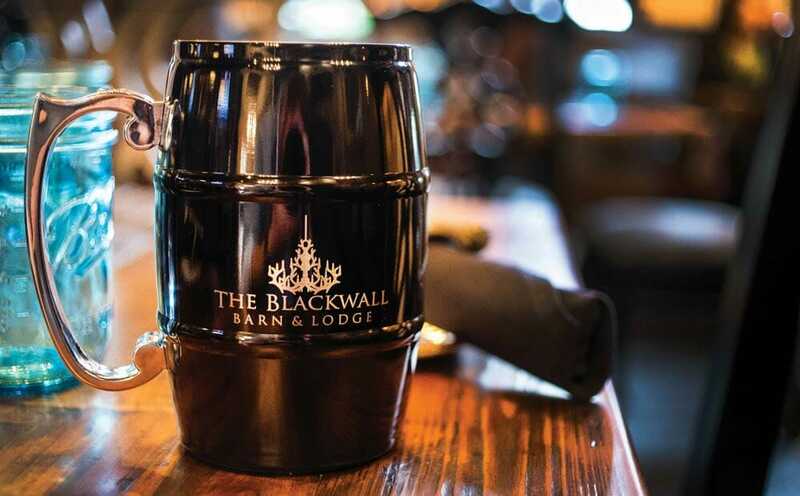 Your personalized mug will be waiting for you for each time you visit The Blackwall Barn and Lodge. This exclusive opportunity is limited so join the Barn & Lodge VIP Barrel Club today. Stop in or give us a call at 410-317-2276 for details. Or fill out this form and bring it by the store. How many total mugs will be sold? We will only be selling 200 total mugs. Where will the mug be kept? The mugs will be displayed behind the Main Lodge Bar on a shelf. What are the benefits to purchasing a mug? All VIP Barrel owners will receive discounted beverages when ordering certain alcoholic beverages at the restaurant. All Draft & Craft Beers, Rail, Call and Top Shelf Liquors, Signature Cocktails, and Housemade Moonshines will be discounted 20%. Wine does not apply to this program. Are there any additional benefits besides discounted alcoholic drinks? Yes, the restaurant will host a 2 hour VIP event once a month for all Barrel Club members. At this event, a complimentary appetizer buffet will be served at no cost to our members. If I do not purchase a mug now, will I have an opportunity to purchase one later? Mugs will be sold on a first come, first served basis. The first 200 individuals to send their form and check for payment in will receive mugs. Once we have sold 200 mugs, we will close the program to new members. Once I have purchased a mug, is it mine forever? Yes, technically, you own the mug and can remove it from the premises at any time of your choosing, however, if you choose to remove your mug from the premises, we will sell a new mug and replace your spot behind the bar. Can I ever lose my mug and my spot behind the bar? Yes, all VIP Barrel Club members are required to spend $100 per calendar year. The calendar year will begin January 1, 2019. If a mug sits dormant for a 12 month cycle with less than $100 in purchases, we will have the right to remove your mug and sell a new mug to the next person on the waiting list. If this happens, we will mail the mug to your home address and notify you that we have sold your spot. Is there any other way that I can lose my mug and my spot? Yes, management reserves the right to refuse service to anyone. Management reserves the right to terminate your membership at will for any cause that we deem appropriate, including but not limited to, unruly behavior, poor treatment or abusive language towards employees or other patrons, damage to property, inappropriate behavior or excessive consumption of alcohol. Can I return my mug at a later date and receive a refund? No, these mugs will be personalized and all sales are final.